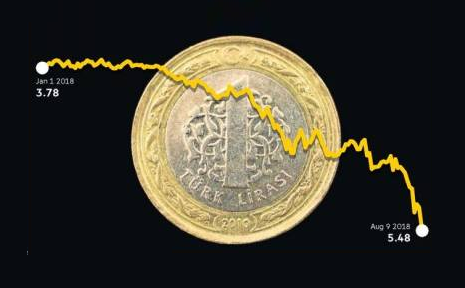 International investors fear nothing more than the words ‘capital controls’ but yet it is indeed this term that is being floated in Turkish financial circles today as a way out of the impasse for the Turkish currency. The US-Turkey standoff over Pastor Andrew Brunson in combination with US sanctions on Turkish government officials has resulted in a fresh all time low. Related coverage: <a href="https://thegoldwater.com/news/33273-Pastor-Andrew-Brunson-US-Showdown-Sees-Turkish-Currency-Drop-To-Record-Low-Video">Pastor Andrew Brunson - US showdown sees Turkish currency drop to record low</a>. It is interesting that this part of the Mediterranean now thinks of the dreaded financial definition of ‘limiting the amount of money people can withdraw from their own bank accounts’ as the last two times ‘capital controls’ were installed it happened in neighboring Cyprus and Greece, both to great popular discontent. Related coverage: <a href="https://thegoldwater.com/news/32500-Pastor-Andrew-Brunson-Turkish-President-Erdogan-Wants-Nemesis-G-len-Extradited-In-Return">Pastor Andrew Brunson - Turkish President wants nemesis Gülen extradited in return</a>. "A painful admittance that his powers are outmatched by the forces of markets and that he may have misjudged the economic situation may be a lot to ask of the autocratic leader Erdogan, but the alternative is that the lira will meet the ground at terminal velocity; an impact that will damage the Turkish economy for years to come." Although the graph above this article may look painful, at the time of writing the Turkish lira has fallen even further, to some $5.9655. The overall drop for the year to date is now over 35%. Mr Hordijk concluded that "the lira is falling so fast that a parachute is the first thing that comes to mind to prevent the lira smashing into the ground."